Advanced Cell Therapy is what ACT represents. 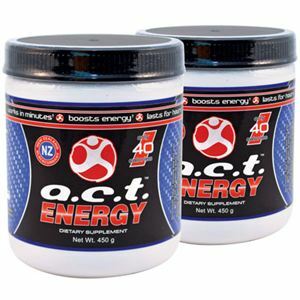 ACT Energy On-The -Go contain a patented balanced combination of all highly effective natural ingredients that work together on the cellular level. The result is that your mental and physical health are improved and you can work for hours. It includes 2 cans A.C.T. Original (450 g each). Ingredients: Vitamin A, vitamin C, vitamin B3, vitamin B6, vitamin B12, crystalline fructose, maltodextrin, Fibersol 2 maltodextrin, potassium citrate, natural flavors, beet powder, seed extract guarana, citric acid, Stevia, Cassis pigment extract (blackcurrant SD), Green Tea 50% EGCG, L – arginine, taurine, L – tyrosine, dry mandarin juice, orange juice dry, dry raspberry juice, Panax Ginseng extract Powder.